Grand Slam U.S.A. offers instructional lessons for a variety of different sports and activities. 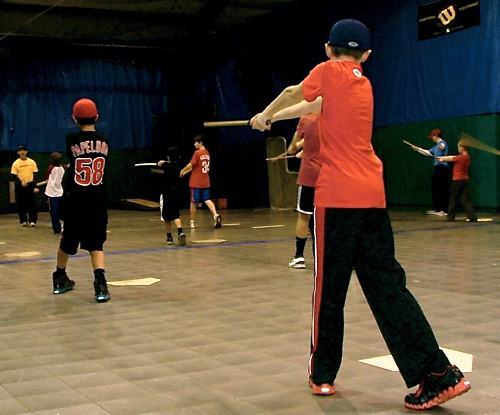 We are best known for our baseball, softball, tumbling and basketball instructional programs which for thirty years have helped players improve there skills and have more fun playing the game. Our 5,000 square foot teaching academy allows for plenty of room for pitching, hitting , and fielding practice so that lessons may be tailored to a player's specific needs. Our coaches are experienced with teaching beginners all the way up to high school players and will structure lessons accordingly. Grand Slam also offers basketball instruction in the fall. We are always looking to add programs and activities so be sure to check back often for updated information. Private Lessons Available Year Round. $70 for 1 hour $45 for 1/2 hour. Price breaks available when you sign up for 5pack, 10 pack or 20 pack of lessons. Call Grand Slam for more info and to contact a coach. One hour clinics with Academy director Chris Ray. Get the practice you need, and gain knowledge that it takes to get even better!